This durable metal support is strong and hardwearing, manufactured from 5mm steel rod with powder coating offering protection against rusting and weathering. The both ornamental and practical heart shaped top is designed to support up to 2 stems. For increased stability when fitted into the ground this plant support has a stepped design stake. These plant supports are manufactured in the UK. Size: 100cm high x 15cm wide x 5mm diameter. 75cm (30") Blacksmith Plant Support. This strong metal support is strong and hardwearing, made from 5mm steel rod with powder coating offering protection against rusting and weathering. The both decorative and practical heart shaped top is designed to support up to 2 stems. For additional stability when fitted into the ground this plant support has a stepped design stake. These plant supports are made in the UK. Size: 75cm high x 15cm wide x 5mm diameter. These plant supports are designed just to add a bamboo cane to make simple and effective border plant support. Made from durable plastic and PVC coated steel, ideal for borders, flower beds and plant troughs and containers. Size: Diameter 30cm x Up to 150cm high. Pack of 10 Stem fix for securing plant stems into brick work or other masonry. These stems clips are a plastic loop which locks into the head of masonry nail. Pack contains 10 masonry nails and 10 plastic loops. These metal plant supports are easy to use, simply screw the centre leg into position and push into the ground above your plant. The spiral section can be twisted around your plant to offer protection and support. 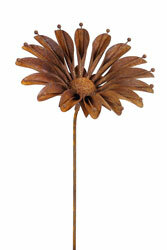 This metal flower support is coated with a stylish dark green finish which will blend in with your garden. 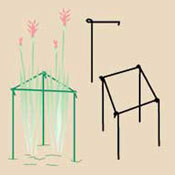 These flower supports are ideal for use in garden borders and containers. Size: 60cm High x 30cm Diameter. 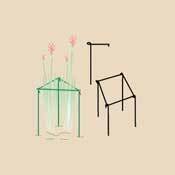 These metal durable and rust proof plastic coated steel plant supports are suitable for all long stemmed pre established plants which can be applied after growth. 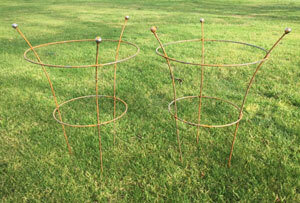 These plant supports can be used singularly as a hoop or used in pairs, back to back or to form a complete circle. Size: 20cm x 35cm (8" x 12"). Size: 45cm x 60cm (18" x 24"). Size: 52cm x 90cm (20" x 36"). 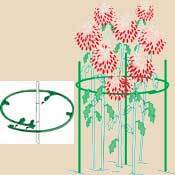 These flower support rings are ideal for the support of long stemmed plants. These plant support rings can be applied to existing plants. These plant support rings are made from durable plastic coated steel. Size: 40cm diameter x 61cm high (16" x 24"). Size: 40cm diameter x 91cm high (16" x 36") - Double ring. 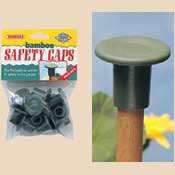 These gardman conical plant supports are ideal for all long stemmed plants in flower borders and flower containers. These flower plant supports will provide maximum support. 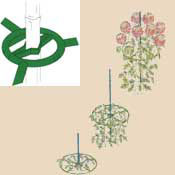 These flower supports are made from steel and green plastic coated for long life. Size: 18cm diameter x 48cm high (7" x 19"). Size: 26cm diameter x 60cm high (10" x 24"). Size: 32cm diameter x 75cm high (12" x 30"). 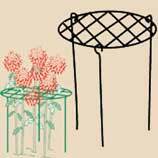 This tomato cage plant support is suitable for all climbing fruits, flowers and vegetables. These climbing tomato supports are adjustable to allow you to give your plants more support as it grows. Perfect for containers, flower beds and flower borders. 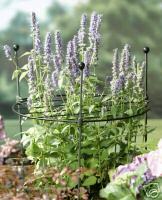 These metal ring plant supports can be used to contain already established plants. Easy to use push the leg section into the ground behind the plant, attach one end of the ring and gather the plant inside the ring. 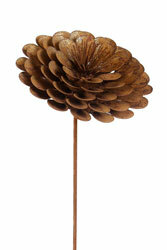 This metal flower support is coated with a stylish dark green finish which will blend in with your garden. These flower supports are ideal for use in garden borders. Size: 70cm High x 40cm Diameter. 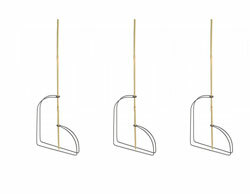 These metal garden loops supports are versatile which can be used as a circle support or to form two loops side by side. Can be used for plants to grow through or used on already established plants. 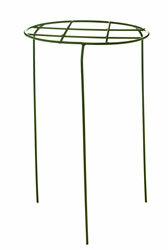 This metal flower support is coated with a stylish dark green finish which will blend in with your garden. These flower supports are ideal for use in garden borders. Pack contains: 2 loops and 3 leg supports. Size: 35cm High x 20cm Diameter. Size: 45cm High x 30cm Diameter. Size: 60cm High x 45cm Diameter. Size: 90cm High x 50cm Diameter. This metal grow-trough plant supports are easy to use, simply screw the centre leg into position then push into the ground above your plant. 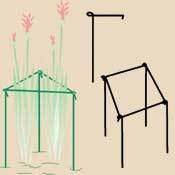 These plant supports are designed for supporting the long stemmed plants. These supports are coated with a green finish which will blend in with your garden. This is perfect way to a perfect border. Size: 60cm High x 38cm Diameter. Size: 75cm High x 45cm Diameter. This metal plant support has a tube fastening for secure fixing. Versatile plant supports, can be used in a variety of configurations. Can be used to gather up already established plants. These supports are coated with a green finish which will blend in with your garden. This is perfect way to a perfect border. Size: 45cm High x 17cm. Size: 60cm High x 23cm. Size: 75cm High x 37cm. Size: 100cm High x 37cm. 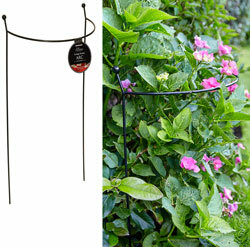 This metal garden hoops plant supports combine two hoops to create an obelisk style plant support for use with climbing plants such as sweet peas. These plant supports can also be used to support and protect tall stemmed plants such as delphiniums, simply slot in one hoop behind the plant. These supports are coated with a green finish which will blend in with your garden. This is perfect way to a perfect border. Size: 60cm High. Pack of 3 hoops. Size: 90cm High. Pack of 3 hoops. Size: 120cm High. Pack of 3 hoops. Size: 145cm High. Pack of 3 hoops. These metal one piece construction plant supports are both decorative and practical, providing support for long stemmed plants. Plastic coated for long life. Size: 50cm high x 18 diameter. Size: 63cm high x 26 diameter. Size: 75cm high x 32 diameter. 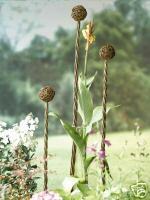 These single stem plant supports are ideal for heavy headed plants. 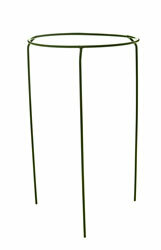 These plant supports are made made from green durable plastic coated steel. 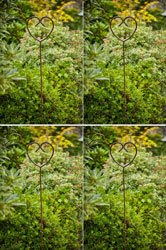 This metal border plant support is an easy way to prevent unruly borders spilling over into paths and driveways. Simply push the two legs into the ground and attach the wavy section to create a sturdy support. Size: 90cm High x 1 metre Wide. These plant suppports are ideal for the lower bushy plant. This spiral plant support is ideal for garden troughs and containers. These plant support stakes are made from steel, with powder coated for long life. This plant suppport is ideal for the taller plant. This spiral plant support frame is ideal for garden troughs and containers. 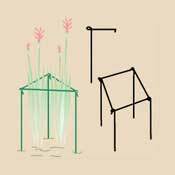 These garden plant support are made from steel, with powder coated for long life. This metal plant suppport is ideal for the taller plant. This spiral plant support system is ideal for garden troughs and containers. 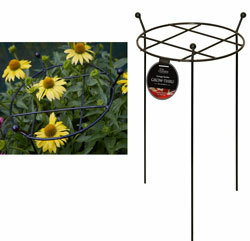 These garden plant support ring are made from steel, with powder coated for long life. 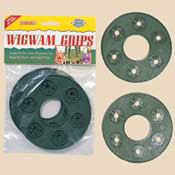 Wigwam Grips are used with six 240cm (8 ft) canes or stakes to make a Wigwam or Tepee Type of support. Simply push the canes through the grip and push them into the ground to make a stable growing frame. There are 2 grips in each pack. 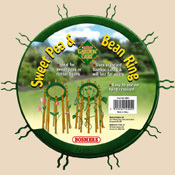 Can be used to support Beans, Sweet Peas and other types of climbing plants. For eye and face protection. Made of soft plastic these caps will fit on the top end of most sizes of bamboo cane. A circular support that can be used with a single cane or stake. It is best to put them in position early in the season so the plant can grow through the support. 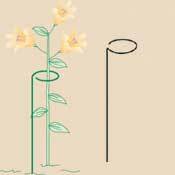 The height of the circle can easily be raised as the plant gets taller by sliding it up the cane. A circular support that can be used with a single cane or stake. It is best to put them in position early in the season so the plant can grow through the support. The height of the circle can easily be raised as the plant gets taller by sliding it up the cane. Very useful for delicate large headed or bushy flowers such as Dahlias etc. 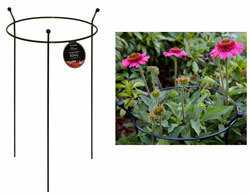 A circular garden plant support that can be used with a single cane or stake. Position early in the season so the plant can grow through the plant support system. The height of the circle can easily be raised as the plant gets taller by sliding it up the cane. Plant supports are ideal for many climbing plants. Please look at our other supports for plants. 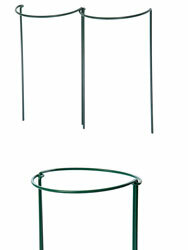 An expanding circular garden plant support to used with 3 canes or stakes (not included). It wraps around the plant so it can be used later in the season when the plant needs the support system. Works well with bushy plants such as Dahlias etc. Look at our other plant support sytems that we offer. 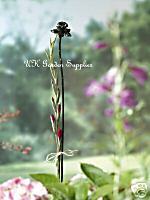 Individual garden plant Supports suitable for many types of single stem flowers. The climbing plant support is made of strong wire coated with dark green UV Stabilised Plastic. Supports for plants can be easily pushed deep into the ground for upper plant stability. Look at all other garden plant support systems that we offer. Flower Frame Plant Support with 3 legs. 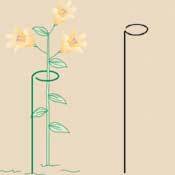 Multiple garden plant flower supports are suitable for many types of bushy flowers. The plant supports are made of strong wire coated with dark green UV stabilised plastic. The plant support rings can be easily pushed deep into the ground for upper plant stability. The grid construction of the mesh gives individual bloom support. These plant supports can be put in place early in the season to allow the plant to grow through. Complete with mesh garden plant support and three stakes. Look at our other plant support systems in our range. Height: 45cm 18in Diameter: 30cm 12in. Height: 63cm 25in Diameter: 45cm 18in. Height: 91cm 36in Diameter: 55cm 22in. This pack of 5 versatile flower plant supports can be arranged into many different shapes by just linking the climbing plant supports together. The supports for plants are made of substantial wire coated with dark green UV stabilised plastic. The garden plant supports can be easily pushed deep into the ground for upper plant stability. Look at other plant support systems in our range. 60cm Garden Border Plant Support. Two strong legs joined with a semi circular horizontal form this garden plant support. The climbing plant supports are best used for supporting bushy plants that tend to lean as they grow taller. Two of the garden plant supports can be used together to make a circular plant support or side by side to give continuous border plant support. 76cm Garden Border Plant Support. 90cm Garden Border Plant Support. Can be used with 10 canes or stakes between 1cm (.3in) and 1.5cm (.6in) diameter at the top to make a support frame for Sweet Peas or Runner Beans. Just push the canes into the ground and then into the support ring. No tying required. This plant support stake is not only practical but decorative too. Adding class and elegance to any garden. Use to stake tall plants in a border or container or as a feature. The mesh diameter measures: 38cm (15"). The mesh diameter measures: 45cm (18"). Loop-it plant support can be used for herbaceous plants take the stake push into the ground evenly around the plant and thread the twine trough the plastic attachment . Pull the twine to support the plant and tie off. Twine is not included in the price. 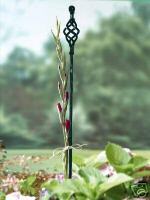 These flower support stakes are stylish embellishment for traditional and contemporary gardens. These plant support stake is particularly striking in borders and pots. 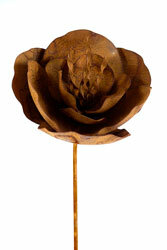 These flower border stakes are made from durable metal in antique bronze finish with a forked base for stability. These garden border stakes add a touch of extravagance to borders and pots. 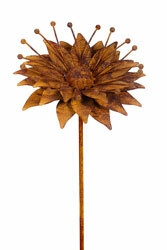 These cast iron flower stakes are both decorative and practical, they act as great plant supports too. Made from solid cast iron construction in an attractive rust effect finish. 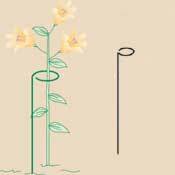 These flower support stakes are 100cm high with a forked base for stability. Use to stake tall plants in a border or container as a feature.